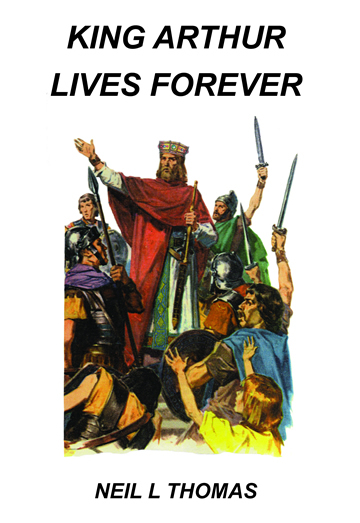 “King Arthur Lives Forever”” is a story of Arthurian times. Prosperous Britannia had many cities and towns supported by an agricultural and commercial economy. Hundreds of large Roman style estates throughout the country were owned by native British and retired Roman legionnaires. Farmers grew cereals, raised cattle and sheep to feed the populace. Mining industries produced iron, copper, tin, lead and gold. Commerce prospered. King Arthur’s forebears and successors, his kith and kin are known. Their pedigree begins in the fourth century with clan chief Cynedda of Scotland through to King Eliseg of Powys in AD 850. Raiders and invaders from other lands and across the seas envied the Islands’ wealth with covetous eyes. Britain needed a leader to protect the country. King Arthur had the military skills and ability to take British forces to victory from AD 480 to AD 519. Many battles were fought up and down the country, places and dates are newly identified. More than a dozen battles were fought against Saxon, Angles, Irish and Scots aggressors. The famous three-day Battle of Bath in AD 495 featured the colourful highly symbolic and allegorical tale ‘The Dream of Rhonabwy’, a story of people, their origins and rank. Saxon opponents were defeated and paid a large ransom. Played by kings and nobles in Britain and Ireland, a board game was named ‘Kill the Goose’. The symbolically significant game is featured in a number of important Celtic folk tales dating from the fifth and sixth centuries. A game of strategy and counter move, the Normans adopted the game in the twelfth century and gave it the English title ‘Fox & Geese’. The bubonic plague pandemic of AD 545 spelled the end of a prosperous Britain. The native population was seriously affected, aggravated further by increased Saxon and Angles conquest and settlement of England. The next four centuries are termed the “Dark Ages” in the history of Britain. Dr Neil L Thomas like many other Australians of Welsh ancestry was interested in the real King Arthur. Benefiting from recent research, he has assembled scattered evidence to bring the reader a coherent account of commerce and prosperity in Arthurian times in Romano-Celtic-Britain. King Arthur Lives Forever is a reality check for those who think the Arthurian legend is mere fiction. Excavating the subject with great enthusiasm, Dr Neil L. Thomas lifts Arthur out of Camelot – that mythical round table world – to present the real man, the living, breathing leader of men who battled for Britannia. King Arthur Lives Forever describes an ancient world of tribes and mercenaries and argues climate cannot be overlooked when chroniclers account for Arthurian times. Arthur’s family tree untangles his Welsh forebears. Scenes are well set. Dr Thomas’ most significant contribution is his interpretation of Latin writings that identify King Arthur’s battles, events based on verifiable evidence. This is not an academic thesis. Author of other history books including an extensive why and when Stonehenge was built, Dr Thomas knows how to convey complex information in an entertaining way, a skill evident as he discusses Celtic board games, precursors to Norman times ‘Fox and Geese’. This engaging book supplies many answers. Simon D. Plant, B.A., M.A., University of Melbourne.